Optoma UHZ65 review | What Hi-Fi? Lasers have long transcended their cultural origins as high-tech weapons in 1960s sci-fi novels and have now become useful for everything from eye surgery and barcode scanning to entertaining your cat. In the tech world, lasers are used to read Blu-ray and CD discs and transfer data through optical cables, and they’re starting to make an impact in projectors too – which isn’t surprising when you consider their practical and performance benefits. While traditional lamps typically last around 5000 hours, laser models can offer five or six times that life. Want to screen Lord of the Rings trilogy every day for ten years? With a laser projector, you can, if you so wish. Laser projectors don’t have a bulb that needs to warm up or cool down and so they’re able to instantly power on and off, making them ready to roll with Rocky or Re-Animator when you are. And, perhaps most importantly, they’re comparatively efficient performers. While lamp projectors produce light, most of which is filtered out to leave the red, green and blue portions needed to produce the full range of colours, laser projectors create colours with red, blue and green lasers. That not only means less power consumption, but also that they are capable of higher brightness levels that won’t deteriorate over time as a lamp does. However, laser projectors also tend to be more expensive. Some of the earlier ones, such as Sony’s VPL-VW760ES, cost well over £10,000. But, as the tech becomes more widespread, there’s a greater choice at lower prices. One of these is Optoma’s UHZ65 - the laser version of the company’s UHD65 (£3000) and a current What Hi-Fi? Award-winner in its price category. First, we calibrate the picture to the screen, which thanks to a vertical lens shift and 1.6x zoom under the hood, takes hardly any time at all. At this price, we might reasonably expect motorised controls operable by the remote to make the set-up process easier, but it’s far from a deal breaker. We fire up the UHZ65 and, playing the Baby Driver Ultra HD Blu-ray through a Cambridge CXUHD 4K Blu-ray player and Denon AVR-X6400H AV receiver, are met with an immediately likeable 4K HDR picture that is a stickler for detail and a dazzler with colours. As the screen fills with colour, the Optoma does justice to director Edgar Wright’s exhilarating homage to ‘90s heist movies. Whether it’s shining red cars or Jamie Foxx’s bling, the colourful graffiti or the bright neon signage, the palette certainly isn’t subtle. But it also tackles the difficult task of being grounded when it comes to delivering skin tones and the mundane cityscape. It nails the balance between punch and precision to such a degree we feel inclined to play every Wes Anderson movie through it. The Sony VPL-VW260ES lamp projector gives the Optoma a slightly higher benchmark to strive for when it comes to absolute insight, and for a similar price. It opens the window into Edgar Wright’s fan-fictional world a little wider, offering comparably subtler, more refined colour reproduction and crisper, more astute lines. The Optoma’s pleasing contrast is on par with its Sony nemesis, though. While you can’t expect a projector to deliver the same plunging depth of blacks as an OLED TV, the Optoma is far from a washout. Fire flames blaze with intensity as they rise into the black bars and there’s minimal blooming around bright lamps and in scenes with car headlights beaming in dingy underground garages highlighting the Optoma’s impressive contrast. Depth perception is distinguished as the camera pans the Atlanta skyline, and Optoma’s PureMotion setting proves invaluable not only during the high-revving car getaways but also in camera tracking and subtler on-screen movement. On level 1 or 2 (our preference), it gets rid of blur and irons out judder in a way that appears natural and unobtrusive. Those qualities combined make for a watch that’s equally absorbing and easy on the eye - just what’s needed for you to take just as much notice of the picture quality as the film’s standout feel-good soundtrack. The performance remains high when fed Full HD material. We play Neon Demon on Blu-ray, and while the picture naturally loses the sharpness gifted by 4K, and the extra pop and colour subtlety by HDR, good detail and tonally even colour reproduction are exposed, capturing the glossy, splashy aesthetic that represents the film’s scrutiny of the Hollywood modelling industry. Further credit to the Optoma’s upscaler, even DVD playback, while relatively soft and noisy, is perfectly watchable. As an owner of the UHZ65, your satisfaction should be long-lived too. The Optoma claims a lifespan of 20,000 hours – the equivalent of one film a day for 27 years – by which time you’ll probably want to replace it with the latest 16K projector (or similar) anyway. Those short on space will be pleased to know that the UHZ65 is smaller than most high-end projectors we have seen. It’s compact enough to avoid being immediately consigned to an AV rack’s top shelf. Of all hi-fi kit, projectors may have the least amount of pressure to look good, and that’s just as well for the Optoma. It’s a non-descript box with a glossy top, and almost completely lacks distinguishing features to the point where its rear connections panel is the only worthy talking point. There are two HDMI inputs, one of which is 2.0- and HDCP 2.2-certified to accept 4K from an AV receiver or 4K source. Elsewhere, there’s ethernet, VGA and 3.5mm analogue inputs, a 3.5mm output and two USB sockets – one for service and one that can be used to power a media streamer, such as Google Chromecast or Amazon Fire TV. 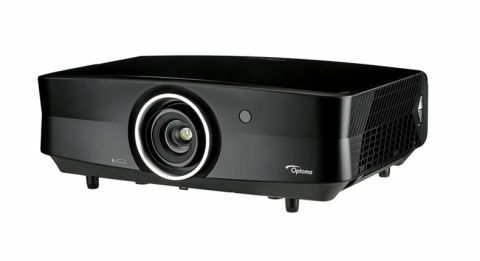 While it may not be the last word in transparency and outright accuracy for the money, the Optoma UHZ65 raises the profile of the laser projector at this price point. It isn’t particularly beautiful to look at, but the performance it is capable of most certainly is. Once again, Optoma confidently offers big-screen thrills. And, thanks to laser technology, those thrills are bound to last.